The search form at the top of results page has been revamped and made more meaningful. You can specify the number of results per search. The bug which causes the “older tweets” link in the footer to omit the location information has been fixed. Subhash TweetsToRSS search form is more meaningful. Support for replying, favoriting, retweeting, and deleting tweets in the timeline. A permanent scrollbar (one that does not fade away) will be available in the main screen. This feature is supported in Android versions 2 and newer. A menu option to retrieve the “timeline” (tweets by you and others you follow) has been added. Earlier, there was a context menu option to delete from the “Latest Tweets” section. Now, you can also reply, retweet and favorite on those tweets. The text size of the Twitter message editing box has been increased. A lock password will be required to use EmailTweetor. It is not an extremely secure password system. It can protect the Twitter client in case you hand over your phone to somebody else for just a few minutes. Unlock password protects your Twitter client from misuse. This feature should have been there from the beginning. Earlier, the app used to copy the tweet URL to the email body. In this version, EmailTweetor will build a list at the bottom of the screen with the Twitter messages it creates. Each tweet in the list will have a context menu with which, you can copy the text or the URL. An option to delete/un-retweet/de-favourite the tweet is also available. Tweets, retweets and favorites are differently colored for easy identification. NetCheck v2019.02.09 for #Linux, #Mac and #Windows adds ability change ping URL and interval (20 to 300 seconds) via the command-line arguments and notification tray icon menu. The Android version can already change the URL (but not the interval). A bug led to the discovery new capabilities. Support for animated GIF images and videos. Fix for bug which caused only the last image in a tweet to be displayed. Fix for the bug (in Android) causing the locations.html file was displayed as raw HTML. Subhash TweetsToRSS now displays multiples images and any GIF animations or video found in a tweet. The new “book reader” or “article view” mode in Subhash Browser. The download manager has stop (pause) and start (resume) menu options for individual downloads. I don’t know when I added these options. They seem new. A bug in the creation of internal RSS files for All India Radio and AP news was fixed. These feeds will have to be removed and added again. Deleting an old feed does not lock up the app, as it files are deleted in a background thread. Feeds button will display an error message if the page does not have any feeds instead of displaying a perplexing empty list. Desktop browser disguises have been updated newer UA strings. Twitter displays the mobile page even on desktop browsers if the version is a few years old. The title of a loading page appears much earlier than it used to. There is an onReceivedTitle event which I did not think of using earlier and waited for the onPageFinished event to display the title. RDF feed support became missing after I added support for Techtree’s broken RSS feed. Now that it is fixed, Techtree will now be broken. Their RSS not only lacks an XML tag, it has two root tags!!! Like the Android version, it can tweet, reply, delete, favorite and retweet but it cannot alas email. 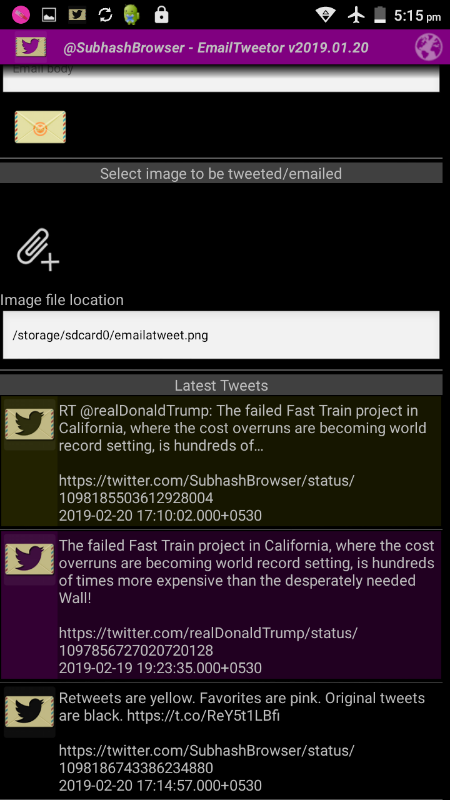 This terminal-based Twitter client can be operated interactively or automated using command-line parameters. To prevent your bash history from getting cluttered with unsightly tweets, you cannot specify the message in the command line. However, you can do pipe redirection or use a text file. The Twitter client is extremely powerful so I have not documented all of its features in the help. EmailTweetor was made with Oracle Java version 1.8.0_101. So, ensure that your JVM (Oracle or OpenJDK) is newer or equivalent. EmailTweetor lets you tweet from the command line. Like All India Radio (AIR), Associated Press (AP) also removed their RSS feeds. Not that I follow this wire service but some people do. So, like my previous update which generates an internal RSS feed for All India Radio, this update generates an RSS feed for AP. This page has a JSON file with all the data and image files but I ignored it. AP is rather a scrappy news agency and they have gone after people who linked to their stories. I don’t want Subhash Browser to scrape their data too much. Hence, no images. I also discovered an bug in AndroidWithoutStupid library, which I had to fix to make it working. Subhash Browser reads the AP news page and generates an internal RSS feed. In the previous update, I added support for All India Radio news. However, the RSS newsfeed for it was generated internally by the app rather than retrieved from the AIR website (where none exists). On a new install of the app, AIR News was one of the built-in RSS feeds. Old installations had no way of installing it. In this update, an option for that has been added to the feed reader. The download manager now plays a “download failed” audio file if a download fails. This feature was available earlier but got removed when a dedicated download manager screen was added. The default set of news feeds have also been updated. Subhash Browser generates an internal RSS file for All India Radio news. If the Language setting of Subhash Browser is changed to Malayalam, Tamizh, Kannada, Hindi or Urdu (before loading the feed reader), then a filter will be added to the AIR news feed for that language. Otherwise, the feed will be unfiltered and each update will bring news in more than a dozen languages. Unfortunately, Modi government has removed Urdu news. I have added the filter in the hope that it will be available in future. I read Hindi with difficulty so support for Hindi news in the RSS feed can be expected in the distant future.